The Libyan people are going strong against the government! Almost 100 people have died for freedom in the past 3 days! These people died to see a change! They died to give the rest of us hope! And even though they are no longer a part of this world…we need to keep them in our hearts. 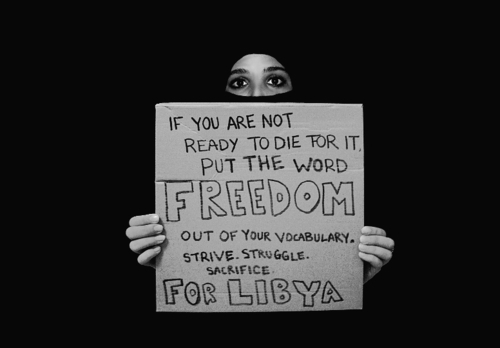 The Libyan people need to keep fighting for their freedom! Nobody can give you freedom. Nobody can give you equality or justice or anything. If you’re a man, you take it. Please reblog and tweet about Libya to raise awareness. Please, I am begging you! Help my people! One tweet and one blog post will not affect your life, but it will affect theirs! The people need help: the media can’t get in, the phones are all monitored, the hospitals are overcrowded and are in desperate need of blood, people are hurt and dying, the army is ruthless, and Gaddafi is still there…but the people are not giving up hope! That means, neither can we! Hope for all! What a wonderful article and how beautiful the alfred angelo plus size 1142w wedding dress are in the pictures! I want to buy this alfred angelo plus size 1612w wedding dress while my fiancé prefers another which I don't like at all. I'm looking forward to better articles from you, introducing to us various styles of alfred angelo plus size 2007w wedding dress. Good luck to you! It was really strange that even before I finished reading your article about this watters brides 1036b I began to feel that you were a kind-hearted person Your article is very interesting and will be better if you can give more introduction of this watters brides 1039b. I wantto buy this watters brides 1052b while my fiancé prefers another. Could you help me and make friends with me? It 's the most wonderful article I have read recently. My fiancé and I disagree with each other on what watters wtoo brides vesper to buy. I prefer this one while he another. I'd like to have your opinion, thank you. >What a wonderful article and how beautiful the la sposa dirlan are in the pictures! It's great that your article gave me lots of help.I want to buy this la sposa diosa but I have no idea on how to choose a la sposa dinar. Could you help me? I’d like to be friends with you and how do you like the la sposa dilan I will buy? What a wonderful article and how beautiful the la sposa diciembre are in the pictures! I want to buy this la sposa dicha while my fiancé prefers another which I don't like at all. I'm looking forward to better articles from you, introducing to us various styles of la sposa diana. Good luck to you!